You'll need: kale, grated cinnamon, garlic, ground black pepper, sea salt and olive oil. 1. Preheat oven to 250 degrees. 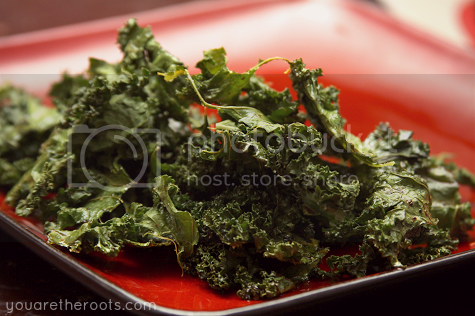 In the meantime, toss small shreds of kale onto a cookie sheet and drizzle with olive oil (don't soak them! Drizzle!). 2. Using a basting brush, toss the kale pieces around in the olive oil. I don't measure, but I sprinkle a pinch of sea salt and some black pepper over the pieces of kale. I use a hand grater to grate fresh garlic over the kale chips to your preferred taste. For a big bunch of kale, I typically use one to two cloves. 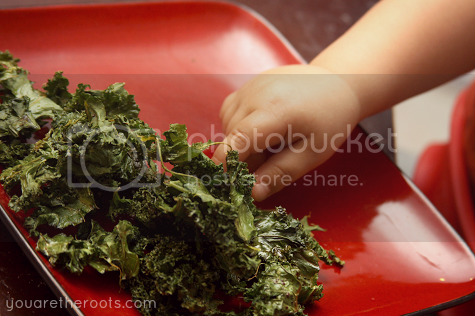 As a finishing touch, I sprinkle a tiny bit of cinnamon over the kale chips before placing them in the oven. 3. Bake for 15 minutes. Remove from oven and toss the kale chips around with the basting brush and make sure none are sticking to the cookie sheet. Place them back into the oven and bake for 20 minutes. 4. Remove from oven, let cool and enjoy! Kale chips are a favourite around our house! I love all the different ways to spice them up. Thanks for sharing your recipe, these look amazing! Thanks so much for sharing! My kiddos love the store bought ones and I've never attempted to make them. You've inspired me!